A Eurasian species; in disturbed ground in Michigan but perhaps not persisting. Collected by J. W. Robbins on the Keweenaw Peninsula in 1863 (GH, MICH), and by O. A. Farwell at Detroit (Wayne Co.) in 1894 (1460, BLH). The fruit is strongly spiraled, unlike all our other species except. M. minima. Even in a narrower sense than the original breadth assigned to it by Linnaeus, this is an extremely variable species. The corolla in both this species and M. minima, is slightly longer than in M. lupulina, but distinctly smaller than in M. sativa. MICHIGAN FLORA ONLINE. A. A. Reznicek, E. G. Voss, & B. S. Walters. February 2011. University of Michigan. Web. 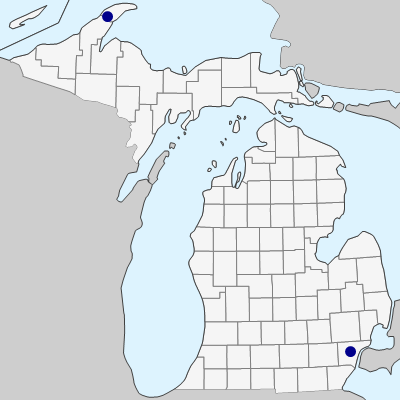 April 20, 2019. https://michiganflora.net/species.aspx?id=1331.